Humphrey School's Robert Kudrle, professor and Orville and Jane Freeman Chair in International Trade and Investment Policy, has been a frequent media contact on the recent tariffs and tariff warnings coming from the Trump Administration, including four interviews with the Star Tribune, two with Minnesota Pulbic Radio, two with WCCO radio, and one with the UMN campus paper, Minnesota Daily. 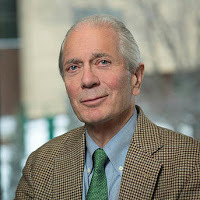 Robert T. Kudrle is professor and Orville and Jane Freeman Chair in International Trade and Investment Policy at the Humphrey School, and an adjunct faculty member with the University of Minnesota Law School. He studies industrial organization, public policy toward business, and international economic policy. Much of his recent research has examined economic relations among industrial countries. He has served as a consultant and expert witness for the Antitrust Division of the U.S. Department of Justice and as a consultant to the Internal Revenue Service, Canadian Department of Consumer and Corporate Affairs, U.N. Center on Transnational Corporations, Overseas Private Investment Corporation, Agency for International Development, and Urban Institute. Kudrle has been vice president of the International Studies Association. Kudrle is past co-editor of International Studies Quarterly and subsequently served on its editorial board. He has also served on the editorial boards of International Interactions, the International Political Economy Yearbook, International Intensives, and the Minnesota Journal of International Law. A Rhodes Scholar, Kudrle holds a doctorate in economics from Harvard University and master of philosophy degree in economics from Oxford University.